Design – Teachers should ask how the following concepts apply to managing and designing lessons. For example, what does the design of your daily lesson plans look like? Is it ugly black and white with multiple handouts? What story does that tell? Can all students relate to such the teachers presentation of content? In this presentation you will learn about the concept of design and how design is applied to integrating technology into a digital lesson. Design starts at the beginning not at the end; it's not an afterthought. The primary focus for educators should be on expanding the quantity and quality of ways in which the learner is exposed to content and context. Educators should design extended learning opportunities in ways that immerse students in content by using various existing technology tools that include wiki’s, blogs, and the development of technology-based interactive lessons. The premise of expanding educational delivery in ways to include Web 2.0 opportunities is constructed around the idea that the more children can experience what they are learning and the more teachers immerse students in the learning process the more engaged students will become in interacting, listening, viewing and valuing their education. In this portion of our presentation of "Designing Highly Engaging Lessons; The Collaborative Way" we will provide information on how to design co-creative collaborative leaning environments through well designed Web 2.0 interfaces. The purpose is to demonstrate how Web 2.0 open source software applications, like read and write web, can provide an opportunity for extended student learning. Thus the presentation will be divided into several parts, by first defining Web 2.0 read and write web capabilities, while providing you with a Web 2.0 design template. And secondly how the correlation of design can be easily integrated with Common Core Standards and various digital tools that support high engagement learning. To set the stage for Designing Collaborative Learning Environments we will be introducing you to a remarkable video. The video you are about to see was created by Kansas State University cultural anthropologist Michael Wesch. Wesch and 200 student collaborators, that point to one of the most profound problems of today. The Net Generation has grown up digitally and they are living in the 21st century and according to Tapscott, that the current education system is lagging behind in the industrial age model by at least 100 years. Students in Intermediate, Middle, High School and college are now finding means to communicate through the use of social networking tools, such as blogs, wikis and chat rooms. Although these types of collaborations may not be school related they have become Americas youth pastime. While at the same time a majority of schools have yet to be exposed to future capabilities of these new technology tools. The reason being is that education has not recognized the full potentials of Web 2.0 and new graduates in the field of education may now recognize the capabilities forming a gap of understanding and the potentials for harnessing social networking. Secondly more advance schools will begin to encourage Web 2.0 online communities of knowledge gathering while the less advanced will take a back seat wait and see attitude. According to Ken Robinson in "Changing Education Paradigm," "We have to think different about human capacity. We have to get over this old conception of academic, non academic. Abstract, theoretical, vocational and see it for what it is: a Myth. Second, we have to recognize most great learning happens in groups. That collaboration is the stuff of growth. If we atomize people and separate them a judge them separately, we form a kind of disjunction between them and their natural learning environment. And thirdly, it's crucially about the culture of our institutions. The habits of institutions and the habitats that they occupy." Due to deep changes in technology, education is entering a new age where students can participate in their own expansion of knowledge like never before. In fact the MySpace generation is the largest online community in the world, where over100 million young people hangout daily. Is the classroom an exciting intellectual environment where topics are mirrored? Is the content of schooling compartmentalized and separated from cross curriculum unit development and technology-based project learning strategies.? All of the above questions illustrate other aspects of experience in which a student is immersed. Students need to grasp larger patterns. The part is always embedded in wholes, the fact is always embedded in multiple contexts, and a subject is always related to many other issues and content. To begin answering these questions we will need first to explore the dynamics of Web 2.0 applications and how these applications can serve to further explore classroom directed concepts. Concept development through the emersion, emersion within co-creative collaborative learning environments. The world of read in write web has been founded on the principals of collaboration and they are embedded into the new developments of wiki's and blogs, similar to face book although can be much different in educational expansions. 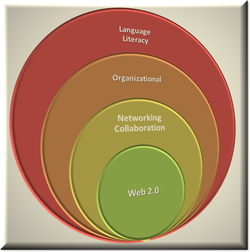 Web 2.0 is a new set of tools that allows users to collaborate ideas through new mediums of expression. These mediums of Web 2.0 collaborative expressions allow non-web designers to create, remix, and mash together their own content online. Enter the new age of education, the conceptual age. word press as you guide. As the process of constructing your online collaborative working environment begins, the Web 2.0 developer should use the school’s current curriculum frameworks as benchmarks for achievement at specific grade levels. The lesson designer should identify ways to incorporate technology so that the students will achieve new standards set within the Common Core. The online Web 2.0 collaborative learning environment the teacher develops using this process will serve as samples of what is possible when technology steps outside the classroom and moves into the classrooms.Integrating technology and unit develop will encourage a curriculum that is both challenging and collaborative for students.